BedWatch® Bed Control is a cutting-edge bed management system designed to give patient placement and housekeeping staff real-time visibility and access to detailed bed status information, so that they are consistently able to turn beds over more quickly and place patients in the right bed, right away. Operating in the cloud, Bed Control is a 100% mobile application, accessible from any Internet-capable device — including smart phones, tablet computers, laptops, and desktop computers alike — allowing users to manage patient placement in real time, on or off-site. The Bed Control Bed Board (above) provides a detailed view of each unit and bed in the facility or facilities, including the length of time each bed remains dirty, when the cleaning is in progress, and how long each turnover takes. It also allows users to designate a room as “STAT,” which automatically notifies the appropriate, available housekeeper, as well as the EVS manager, that the bed is a priority. Real-time notifications inform house supervisors and placement staff as soon as beds are clean and ready for the next patient. 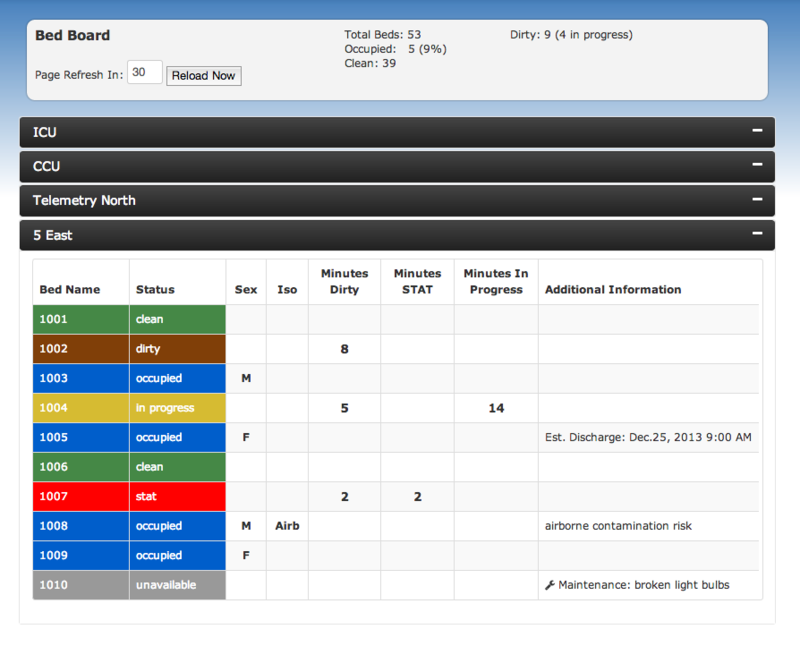 View an example of our Reporting Dashboards. Review some of our Real Hospital Results, or learn more about our Comprehensive Build-In Reporting, our Features & Benefits, and our other Products & Services. Contact us to learn more about Bed Control and schedule a live demo, or request a custom price quote for your hospital.